CHANDIGARH: It is time for Punjab to return to its normal routine, resuming its rhythm and pace now that the echo of the tercentenary has faded into silence. As improvised infrastructure and make-shift stalls are dismantled, dust settles down on the lily-white city of Anandpur Sahib, which exuded religious festivity and fervour the past week. PATIALA, April 15  An inquiry has been ordered into the allegations made by arhtias and farmers here that the government had supplied low quality gunny bags for wheat procurement this season. ANANDPUR SAHIB, April 15  After two weeks of hustle and bustle and participation by lakhs of pilgrims in the tercentenary celebrations of the birth of the Khalsa here, the white city", except for areas near Takht Sri Kesgarh Sahib, wore a deserted look today. CHANDIGARH, April 15  Capt Amarinder Singh, President of the Punjab Pradesh Congress Committee, said here today that Rs 700 crore had been "wasted" on the construction of the Sutlej-Yamuna Link canal. 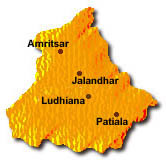 PATIALA, April 15  On Monday within five minutes four fire-break out calls were received by the Fire Department here. In response to the first call the only fire engine in operational condition was sent to Nabha 'bir'. Nothing was done in response to other three calls from Budanpur, Raipur and Gajewas villages as no fire eigines could be arranged for three villages. AMRITSAR, April 15  In a significant development, the Pakistan Government is reported to have set up an All-Pakistan Sikh body of the Pakistan Gurdwara Prabandhak Committee to manage Sikh shrines in the country, wresting control from its Wakf board and the SGPC, according to reports reaching here today. CHANDIGARH: It is time for Punjab to return to its normal routine, resuming its rhythm and pace now that the echo of the tercentenary has faded into silence. As improvised infrastructure and make-shift stalls are dismantled, dust settles down on the lily-white city of Anandpur Sahib, which exuded religious festivity and fervour the past week. It also sent out the universal message of "oneness of mankind". While millions paid obeisance at Takht Keshgarh Sahib forgetting the traumatic past, the religiously and politically influential Akali leadership held parallel shows and spoke in a different language. It symbolised that the Sikh community is keen to forget the torturous past and carve contours of a new future. But the latter would not withdraw the scalpel from the hurt psyche. The ordinary devotees and Sikhs showed a new resurgence, confidence, unity and displayed bonhomie, as noted journalist and former diplomat, Kuldip Nayyar summed up the scene at Anandpur Sahib. The leadership, both religious and political, has, however further widened the chasm and deepened the old wounds. The Khalsa Panth has made its presence felt worldwide. The inter-faith conclave showed that the followers of the Guru celebrated Baisakhi with joy, transcending religious barriers and giving to the world a declaration (issued by the spiritual leaders) underlining religious tolerance, universal brotherhood, and showing how in the next millennium the postulates of the Khalsa panth will be relevant for a better social, economic and political order. The Akali leadership is riven by factionalism. The people have seen a phase of secessionist and militant upheaval. Once in the national consciousness there was an omnious ring to the very mention of the Anandpur Sahib Resolution of 1973. At the tercenenary celebrations the hurt of the past was not allowed to resurface though a section of religio-political leadership did attempt to do it by raking up the resolution. The birth place of the Khalsa is historically important, politically significant and a show piece of the concept of a world as "one family". The attention given to it and the largesse showered has attracted criticism. The moot point is what next? political instability in New Delhi and the internal conflicts and contradictions within the line-up involving the political executive, the SGPC, the SAD and the state itself. The future seems to be in a state of siege from within. Mr Kuldip Nayyar said because of the closeness of the SAD and the BJP, problems of Punjab should have been tackled more effectively. Baisakhi was an occasion when a "new thinking" should have been introduced in the community, which has just left behind a bad chapter. One could see the opaqueness of certain operations, involving politicians and religious personalities. If the participation (what to speak of involvement) of the legislative wing of the SAD was negligible so was the role of the organisational wing and subsidiaries. Even the SGPC failed to rise to the occasion.The absence of the Jathedar of Takht Keshgarh Sahib, Prof Manjit Singh, at crucial occasions rankled in the mind of the people. In the post-celebration period, Mr Parkash Singh Badal shall have to "consolidate" the religio-political angularities. Now will begin a political circus with religion (Akal Takht to be more specific) acting as a catalyst to arouse emotions and sentiments of a people who have had enough of mental, physical torture. Both camps (Tohra-Ranjit Singh and Badal-Jagir Kaur) will go to the villages marking competitive politics. The dvelopments in New Delhi will also cast a shadow on the state. The presence of Mr Surjit Singh Barnala on the stage of the Sant Samaj, where Mr Gurcharan Singh Tohra and Bhai Ranjit Singh held fort is not a good political omen for the state politics. Another point which did not go unnoticed was the omnipresence of the Punjab Finance Minister, Capt Kanwaljit Singh. He is charged with having "centralised" everything and functioning "undemocratically". This has annoyed, among others, Prof Manjit Singh. A lot was done for the success of the tercentenary. There is much to answer. The import of the occasion, however, cannot be dismissed. It has sent correct signals regarding Sikhs and the message of the Gurus. The message of greetings from the UNO Secretary General is meaningful. Even the Governor of the State of Wisconsin, USA, Mr Tommy G. Thompson, issued a "proclamation" on the occasion and declared that April 14 be observed as "Khalsa Day" there. A copy of the proclamation was given to TNS by Mr Darshan Singh Dhaliwal, who came all the way for the occasion from there. Thus, the tercentenary, its controversial aspects and parallelism of religio-political leadership notwithstanding, should enable the Chief Minister to pay greater attention to the pressing administrative needs and economic problems. The occasion, has proved wrong those who apprehended trouble. It was one of the most peaceful celebrations. Mr P. Ram, Secretary, Food and Supplies Department, who inspected the wheat procurement process in the district here today, directed the District Food and Supplies Officer to submit a report at the earliest about the quality of gunny bags. The orders came after the Punjab Arhtias Association and some farmers showed the questionable stock of gunny bags to Mr Ram. According to Mr Harjit Singh Sheru, President of the association, the new 50 kg gunny bags tore easily from sides on being filled and during loading and unloading of the bags. He said the density of jute thread was not up to the mark, thus leading to the problem. Mr Mohinder Singh Sahota, District Food and Supplies Officer, when asked to comment, said he had received the orders and had formed a committee of department officers to conduct a survey and file report. Mr Sahota said the gunny bags were purchased from the Directorate of General Supplies and Disposal, Calcutta and Punjab Government was not responsible for the poor quality of the bags. He said the complaints had been received from very few markets. Apart from the problem of gunny bags, the wheat procurement in the district is also likely to be hit by the non-payment of procured wheat to the farmers and the commission agents by the state Food and Supplies Department. Sources in the department said due to the non-clearance of bills by the treasury the payment had not been made to the agents and farmers. While more than 50 per cent of the wheat had already arrived, the commission agents were finding it difficult to purchase more due to non-clearance of previous bills from the department. The situation was more alarming in bigger markets of Patiala and Nabha where the Food and Supplies Department owned one block and some small markets like at Dakala and Lang villages exclusively under the charge of the same department. Mr Harjit Singh Sheru said due to non-payment the arhtias were not able to buy wheat pouring into the market. He said nearly 60 per cent of wheat had already arrived and procured yet the arhtias had not received any payment from the department. He said other procurement agencies had started disbursing payments of the first phase procurement only. Mr Sahota said the problem of payment would be sorted out shortly and the department was waiting for Punjab Government's directions in this regard. A visit to some grain markets by this correspondent revealed that due to sudden inflow of wheat and slow process of procurement the stocks of wheat were piling up at various places. Sources revealed that the space had fell so short that certain procurement agencies had to take private godowns on rent to store the product. At Dakala Mandi members of the Truck Union raised slogans against the slow process of lifting of the produce, according to sources only 8000 of the 80,000 tonnes of wheat, that had arrived at the market, had been lifted. Many trucks were standing at the market for the past two days. A similar situation prevailed at 'Lang' Mandi, in the district, where also arhtias and Truck Union complained of slow lifting of produce. Mr Sahota, said there was an unexpected inflow of wheat produce in the first week of April due to which some problems had arisen but the department had succeeded in sorting out the problem to a large extent. Till noon many of the pilgrims were still camping in the town but most of them started leaving for their respective destinations in cars, trucks and buses by afternoon. Most of the temporary shops, and rehris in the town had disappeared with the end of the tercentenary celebration functions last evening. The temporary shops were being dismantled. However, the dismantling of the main pandal, constructed at a cost of about Rs 1 crore, stages of different religious and political conferences and other such temporary structures will take about three to four days. The mela area, however, was littered with abandoned shoes, disposable glasses and garbage. A large number of pilgrims also took a dip in the sarover before leaving the town and paid obeisance at the Takht and other historic gurdwaras in the town. The city police station here, which was centre of activity during the past week, was also relatively calm as about 4,000 constables and officers, who were here on-duty, had returned to their homes either yesterday night or in the morning today. The SHO of the local police station Mr Virk, told TNS that a few cases of missing children had been brought to them and almost all children had been restored to their respective parents. Only a girl (4) who gave her name as Gagan and said she was daughter of Mica of Mehandipur village, was now at the police station at Nawanshahar and efforts were on to trace her family. "What was the need to construct the canal when there was no surplus water with Punjab to give to Haryana?" he asked. In fact, Punjab was a deficient state as far as meeting its water requirement was concerned with regard to its agriculture needs. From all sources, including canals, rain and tubewells, Punjab had 35 MAF of water while it required 52 MAF water to irrigate 105 lakh acres of land under wheat-paddy cropping pattern, he said. "If Punjab had surplus water, it would not have denied to give it to Haryana", he asserted. When asked what was the solution, Capt Amarinder Singh said there were the Yamuna, Narmada and Ganges rivers, the water of which could be harnessed to give to Haryana and other deficient states. Almost 99 per cent of the water of these rivers was flowing without any utilisation, he added. Seeking action against Mr Simranjit Singh Mann as per the law for raising the demand of "Khalistan", Capt Amarinder Singh said provocative paintings and pictures were also sold at Anandpur Sahib during the celebrations, but no action was taken by the police against those involved in the exercise. He said the matter was brought to the notice of the police, but it did not act. Blaming Mr Gurcharan Singh Tohra and others concerned for Mr Mann's demand for "Khalistan" from the Sant Samaj's stage, Capt Amarinder Singh said Mr Tohra did not condemn Mann's action although he had addressed the gathering there after Mr Mann. Mr Tohra preferred to give a clarification to newspersons instead of telling those present in the conference that he (Tohra) denounced the announcement with regard to "Khalistan" made by Mr Mann. Who would explain to thousands of people who were present at the Sant Samaj's conference that organisers had nothing to do with the demand made by Mr Mann? he asked. Opposing the detention of Sikh youth in jails without trial, Capt Amarinder Singh said it was barbaric and uncivilised to keep anyone behind bars without holding a trial. "Let the law of land take its own course", Capt Amarinder Singh said. "In no democracy such a thing takes place", he asserted. Endorsing the CPI demand for a CBI probe into the alleged misuse of funds meant for celebrations by the Anandpur Sahib Foundation, he said the CPI must have done a lot of homework before raising such a demand. He said it would have been better if the government had created assets at Anandpur Sahib by constructing some engineering or technical colleges instead of wasting money on ostentation and show-off. Farmers were facing problems as procurement agencies had not entered the grain markets to buy wheat. And wherever the agencies had entered the markets, farmers were not being paid money as the government had not got funds from the banks for the purpose, he alleged. He claimed that the Sarbansdani Yatra, organised by his party, was a success. "We were not in the business of show-off and ostentation like the Akalis, but wanted to remove certain misgivings promoted by the Akalis against us." When asked what were the misgivings he wanted to remove, Capt Amarinder Singh said the Akalis were saying for the past several years that the Congress was against Sikhism and its institutions. "By organising the yatra we told people in the countryside that the Congress was not against the Sikh institutions and all propaganda made in this connection by the Akalis was false." Capt Amarinder Singh said when senior Congress leaders went to pay obeisance at Takht Sri Keshgarh Sahib, they were given siropas there. Among the leaders were Mr Rajesh Pilot, Mr R.K. Dhawan, Mrs Meira Kumar, Mr N.D. Tiwari, Chowdhary Jagjit Singh, Mr Bhupinder Singh Hooda and Mr Sat Mahajan. Providing of siropas to Congressmen reflected that the scenario had changed. It was the first time after Operation Bluestar, that such siropas were provided to Congressmen at such an important gurdwara, Takht Sri Keshgarh Sahib. Of the five fire engines within the department two were on VIP duty and the rest were lying idle for the past several months for want of funds to repair those. One engine needs a new body and the other has a minor fault in the gears. According to Mr H.P.S. Bhullar, Assistant Fire Divisional Officer, in spite of various requests to the Commissioner, Municipal Corporation, shortage of staff, fire-fighting equipment and paucity of funds for repairs continues. The Punjab Government had sanctioned a new fire engine in 1993 and given funds to the then Municipal Committee. Yet the engine had not been given to the department. Further the department has ladders which can only go up to the height to 35 feet while there are buildings as high as 50 feet and above in the city. Mr Bhullar lamented that all their requests are turned down on the plea that Patiala has had no major fire. Due to the absence of industry there was a little chance of fire in the future. In the last one month only two major fires were reported from Rajpura and Samana, besides four or five minor ones daily. He had found 68 fire-sensitive areas in the city. The list included AC market, PSEB, Pollution Control Board, Improvement Trust, Beant Singh Shopping Complexes, some hotels and almost all schools. Mr Harkesh Singh Sidhu, Commissioner, Municipal Corporation, said he had cleared funds for the repair of one fire engine and the old one would be repaired shortly. Interestingly, while the Fire Department is neck deep in problems Mr Sidhu and Mr Bhullar are locked in a war of letters against one another. The announcement is reported to have been made by the Pakistan President, Mr Rafiq Tarar, a day prior to the arrival of the Sikh jatha of about 2000 pilgrims on April 12 to celebrate Baisakhi at the historic Sikh gurdwara of Dera Sahib in Lahore. According to reports received by the Dal Khalsa spokesman, Mr Kanwarpal Singh, Baisakhi celebrations were held at Gurdwara Nankana Sahib, birth place of Guru Nanak, instead of its traditional place of Gurdwara Panja Sahib at Hasanabdal. The new management committee is headed by Mr Mastan Singh, a Sikh councillor of Nankana Sahib. Contrary to expectations, the US-based Khalistani supremo, Ganga Singh Dhillon, and head of the International Sikh Youth Federation, Lakhbir Singh Rode, have been kept out of the committee. The committee consists of Sikhs from Pakistan only. No foreign Sikh or militant staying in Pakistan has been given representation on the committee. The Chief Minister of Pakistan Punjab, Mr Shahbaz Sharif, brother of the Pakistan Prime Minister, Mr Nawaz Sharif, who was invited by the Punjab Chief Minister, Mr Parkash Singh Badal, to participate in the tercentenary celebrations at Anandpur Sahib, however, preferred to be the chief guest of the Baisakhi celebrations held at Nankana Sahib. As usual, leaders of militant bodies based in foreign countries and Pakistan delivered their speeches at Nankana Sahib from the same stage set up by the new gurdwara body. Dal Khalsa and Babbar Khalsa activists were the main campaigners of Khalistan as they set up their separate camp offices in front of the gurdwara premises and distributed Khalistani literature. The Babbar Khalsa distributed coins of Rs 10 denomination and pasted wall posters, congratulating the Khalsa Panth on its tercentenary. It also released a constitution of Khalistan in Lahore. The Dal Khalsa distributed hand bills and Khalistan maps. The militants are reported to have interacted with the jatha members openly. Among those spoke at the congregation were Ganga Singh Dhillon, vice-chairman of the Dal Khalsa, and activists of the Babbar Khalsa and the Khalistan Commando Force. They criticised the Badal government for undermining the sanctity of Akal Takht and in the manner Bhai Ranjit Singh was suspended. A newly formed Sikh-Muslim friendship association held a function to facilitate the Sikh Panth on the occasion of the tercentenary celebrations at Lahore Press Club. It was a non-political function attended by prominent Pakistani poets, television and drama artistes, writers, poets and journalists.